Yes folks. It appears the rumors of my demise have been greatly exaggerated. Still alive, kicking and causing trouble every chance I get. Anyone that knows me can attest to the fact that despite attempting to be a well rounded fly fisher, more often than not I am stomping around in warm water haunts. I will be the first to admit that my trout kung fu is not as strong as many but better than…. well, not sure if it’s better than anyone but no matter. The point is that this weekend I got an invite from my buddy Tim to head out to central PA to chase some trout so I accepted the invitation eagerly. We fished the catch and release trophy trout section of this particular river, the weather was perfect. The sulphurs and green drakes were going off, so we had hopes for some prolific action. We fished the lower section of river all the way to the mouth. My high sticking shoulder was numb and I thought it looked like a good place to huck a few streamers and maybe scare up a smallmouth or two. Tim and Scott were a ways upstream so I had some time to kill. 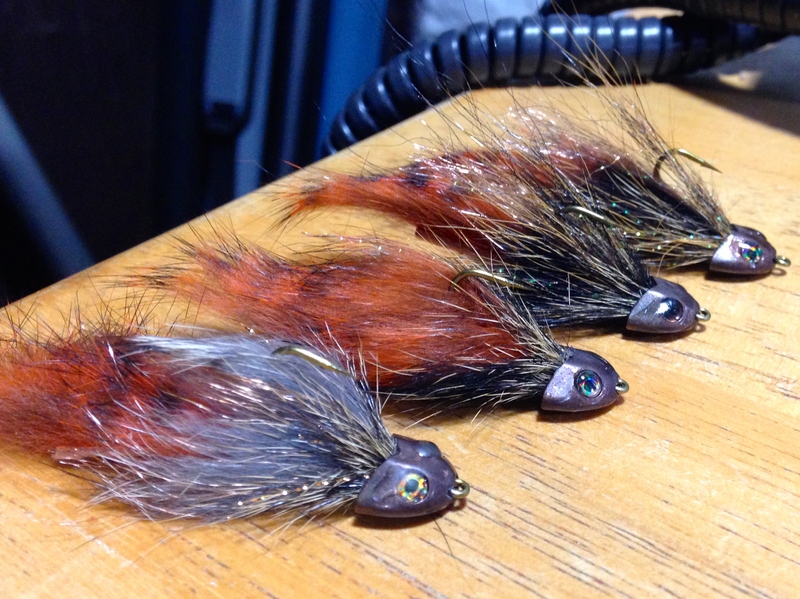 I tied on my go to sculpin pattern…. false casted a few…. and shot some line out into the current and let it swing back around. Once the sculpin crossed the eddy I began to strip it in with long deliberate strips. I looked behind my fly and a ball of orange rolled up. Wham! fly hits a brick wall…. Did I just snag a carp? Head shake… head shake… head shake…. Nope, not a snag. Did a carp just wallop my streamer? I was beyond excited as my brown lining roots tingled. After a day of 14″ trout the idea of a heavy weight scrap on my hands was exactly what I was hoping for. The fish took some line. I gained some ground. After a few minutes of a good back and forth tussle, the fish started to tire. As it came out of the depths I just about fell over. this was no carp. Not only did I just stick my first golden but it was an absolute toad! As I landed the fish, I could feel my hands shaking with adrenalin. This was the biggest trout I had ever caught. I looked around and I was alone on the river with this beautiful fish. Yes… yes… yes…. I know the “hero shot” is over done. Keep em wet.. I get it but I had to get a picture of this fish. Now is where amateur hour ensues. 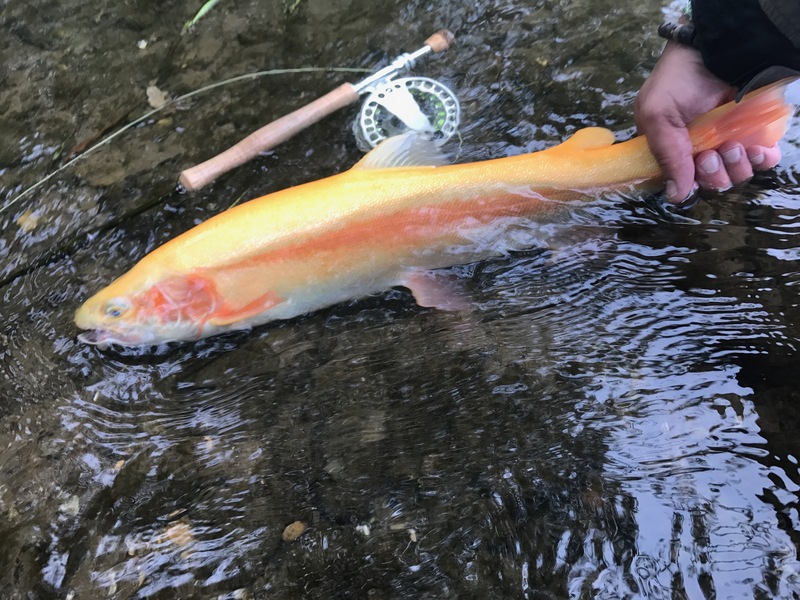 The fish is now in the shallows with me tailing it as my other hand attempts to unzip my jacket, dig through my wader pocket, unleash my iphone, and hopefully take some kind of picture that does this beauty justice…. Epic Fail. I have no exact measurements, no weight estimates, no grip and grin. To be honest, I really don’t even care. Every once in a while if you put in your time, the fish gods smile on you and reward you with an experience. For that I am eternally thankful.